Last night for dinner I made a fabulous grilled Moroccan Chicken with a Carrot & Raisin slaw, dressed with an orange vinaigrette. We chowed it down, even my 8 year old son. It was easy to make, full of flavor and GOOD for you! My friend Bekki told me about this recipe, which comes from Once Upon a Chef. My camera broke a few months ago so I'm limited with pictures unless I use my phone, which is why I haven't blogged much at all this past year. This dinner was too good not to share though, so despite the lack of step by step pictures please give it a try and see if you agree. FYI, this dish is not hot or spicy, so your kiddos will like it too. 1. Slice chicken breasts in half, lengthwise, to make thin chicken cutlets. You can also pound chicken breasts into 1/2 inch thickness. Place chicken cutlets into a large ziplock bag. 2. Mix the olive oil, garlic and spices together in a small bowl or measuring cup. Pour the marinade over the chicken in the ziplock bag. 3. Place ziplock bag for at least 4 hours, the longer the better. 4. Grill chicken on outside grill, or inside on a grill pan, for 3 to 4 minutes on each side, or until cooked through. Do not overcook the chicken! 5. 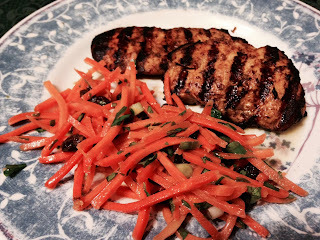 Serve with Citrus Carrot & Raisin Slaw and enjoy! 1. In a large bowl, mix shredded carrots, raisins, scallions and parsley (and walnuts, if using). 2. Mix the remaining ingredients together in a small jar and shake until well combined. 3. Pour over the carrot slaw and let the flavors meld together for 15 to 30 minutes before serving for best flavor. Your blog page is quite amazing with all those delicious recipes. This is the second time we contact you about your blog and this is just a followup. If this message disturbs you, I apologize. I will make sure that this would be my last message that regards to our project. We launched a new search engine for recipes myTaste where we gather recipes from food blogs and websites. It’s a social platform where users can create cookbooks and save their favorite recipes. For bloggers we have a special section Top Food Blogs where you can register your blog and get more visibility and traffic via myTaste!! For any questions or doubt you can check FAQ or e-mail me. Thank you so much for your time, hope to see you in our big family! !